Shalom Italia was one of the most innovative and influential Jewish artists of the seventeenth century. As suggested by his name, he was a native of Italy and a nephew of the Mantuan printer, Eliezer d’Italia. While there has been much speculation about his background, Dutch archival documents reveal that he was born in 1618/1619, and was working in Amsterdam by 1641. Italia’s signed and dated work also demonstrates that he remained active in Amsterdam at least through 1648. According to Shlomo Simonsohn, legal documents suggest that by 1664 Italia had left Amsterdam and returned to Mantua. While living in Amsterdam, he produced two illustrated ketubbot (1648) and portraits of two of the most prominent figures of Dutch Jewish society, Menasseh ben Israel (1642) and Jacob Judah Leon Templo (1641). His most important works, however, are eleven border designs created for Esther scrolls, eight of which are engraved. 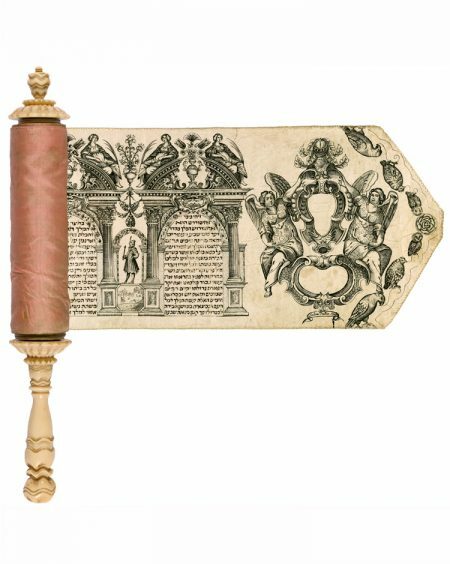 Three hand-drawn- scrolls, including a signed megillah formerly in the Rothschild Collection in Frankfurt, are now in private collections. Shalom Italia’s engraved Esther scrolls established a vocabulary for subsequent megillah design through- out Europe. His work is exemplified by the repeated motifs of triumphal arches, flower-filled urns, and small landscape scenes. Also typical is the placement of a sequence of major characters in the Esther story, in this case Ahasuerus, Esther, Mordecai, and Haman. The border design was created through the use of a single copperplate engraving of four archways that was repeated along the length of the scroll. 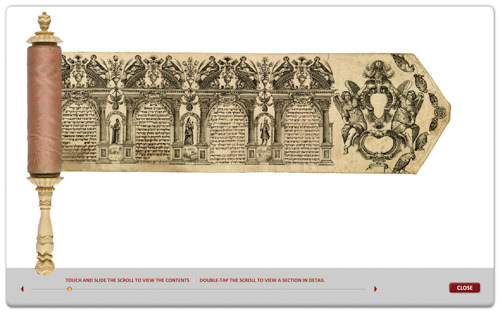 The depiction of six birds at the opening is charac- teristic of many of Shalom Italia’s scroll designs. Between trumpet-bearing angels in the Braginsky Collection megillah, two cartouches intended for family emblems and blessings were left blank. The artist’s printed signature, Salom Italia sculp, appears beneath these opening decorations. The text of the megillah was written within arcade frames above which pairs of gracefully reclining women in classical attire hold palm fronds. The palm, a symbol of victory, alludes to the triumph of the Persian Jews over their enemy Haman. Christie’s East 1998, lots 452, 453, and 454; Christie’s London 1997, lot 34; Franzheim 1990, pp. 74–75; Garel 1986, pp. 107–108; Kleeblatt 1986, pp. 64–65; Museum Guide 1999, p. 46; Narkiss 1956, pp. 87–101 and 88–101; Simonsohn 1977, p. 654; Sabar 1990, pp. 86–105.